Used Mercedes SLC Review - 2016-present | What Car? What's the used Mercedes SLC sports like? The SLC is a mildly facelifted version of the third-generation SLK, a successful two-seat roadster that has brought enjoyable open-air motoring to those desirous of low-cost fun but still want a premium badge. Like the SLK, the SLC looks the part; pert, pretty and suitably sporty, as much at home outside the casinos of Monte Carlo as the supermarkets of Macclesfield. You can choose from a range of mildly sportive or supremely powerful engines, with the entry-level petrol being a 154bhp 1.6-litre in the SLC 180. Then there’s the slightly more lusty 181bhp SLC 200, a very lively 242bhp SLC 300 and a wonderfully quick 362bhp SLC 43. There are only two trims: AMG Line and Sport. 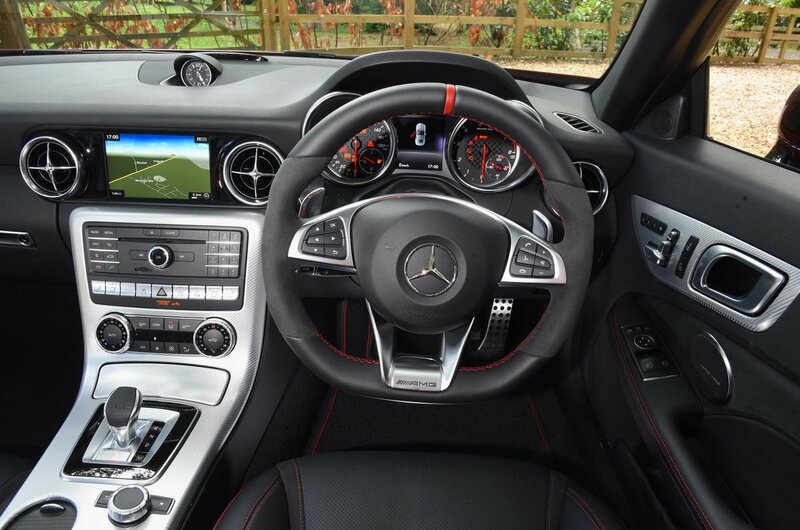 The latter is handsomely equipped, while AMG Line models cover all the basics, including air conditioning, cruise control, sports seats and 18in alloy wheels, although you’ll still have to pay extra for sat-nav or heated seats. On the road, the SLC 180 can propel you to 62mph in 7.9sec and on to a top speed of 140mph. It can also return a claimed 48.7mpg; although you’ll struggle to get close to that in real-world conditions. Even with those rather brisk performance statistics, this SLC doesn’t feel especially fast, though. Choose the standard six-speed manual gearbox rather than the swish automatic option and it can also feel a little ponderous. The SLC 200 is a little quicker and a bit smoother in its response, while those after performance above all else will find it in the SLC 300 and SLC 43 versions, but they will also find spend a lot of time and money at the fuel pumps. 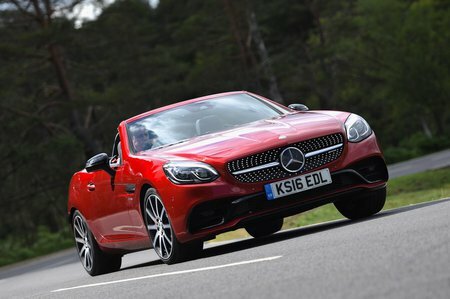 In corners, the SLC grips well, but it’s not quite as pleasant to drive as you might hope. Its steering is quite heavy, with the handling safe, secure and predictable. However, it doesn’t have the levels of fun offered by rivals such as the Audi TT and BMW Z4 or even, for that matter, smaller and cheaper roadsters including the Mazda MX-5. On top of that, like the SLK, the SLC rides badly and struggles to remain decently composed across potholes or broken asphalt at low speeds, no thanks to its standard-fit sports suspension and 18in alloy wheels. Wind and road noise are fairly well contained with the roof up, but there is a certain amount of shake and shimmy and the odd creek from the bodywork. The driver is treated to a comfortable sports seat – although taller drivers will find it simply doesn’t go back far enough – and there’s a neat sporty steering wheel. The SLC's buttons and rotary climate control dials don't feel that nicely damped and a lot of its dash plastics neither look nor feel very plush. The SLC’s infotainment system is also looking very old next to more modern Mercedes models. Mercedes' Comand set-up offers neither the intuitiveness nor graphical slickness of rival systems from BMW and Audi, and is clunky and irksome to use in places. The boot is a healthy size, though, and should hold enough luggage for a week away for two. The only problem is that the space available drops considerably with the roof down.